Playing at the pinnacle or the biggest stage available for one’s sport is always the dream and aspiration of athletes. Such opportunities don’t come cheap. A tough route of qualifiers is always in place to ensure only the best are on parade at World Championships. They looked like rain had not only drenched their bodies but their hopes of greatness. Downcast and frustrated, they were full of regret and swear words. As they rolled on their wheel chairs they felt like rolling back to 2016 when the hard work began. Nigeria's Wheelchair Basketball team were denied the chance of rubbing shoulders with their African counterparts to vie for the sole ticket alloted to the continent for the 2018 IWBF World Championships in Germany next year. Despite the grueling training sessions and other sacrifices by the players, Nigeria was conspicuously missing at the African qualifiers in Durban, South Africa. “It is quite painful for me because all the challenging work has just gone down the drain. "Even with our conditions, we train twice everyday because we really wanted to play in the World championship, but at the end, we were told that there are no funds. "So, we should forget about our participation in the qualifiers in Durban,” Segun Bello a member of the team told Bounce Sports. Quite livid and understandably disappointed, Bello said he has just been denied another chance to showcase his potential that could possibly have earned him a spot in the Euro league and a better life. "The hustle continues. We have to wait for another chance if it will ever come; we don’t have any league in Nigeria. "We barely play two tournaments all year long so it is frustrating down here. "Our few colleagues that now play abroad were mostly seen during international competitions, so we were really ready to win the qualifiers and go to the World Championships” Bello lamented. 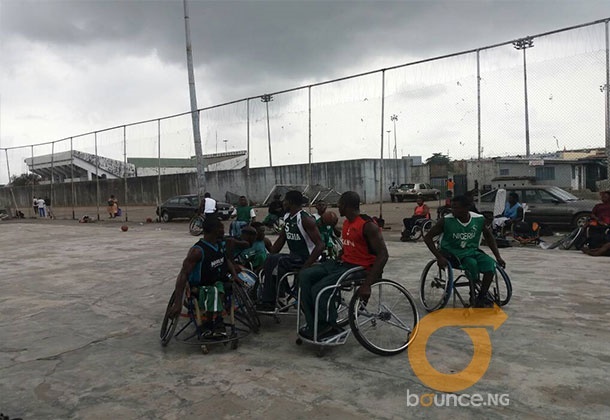 For coach of the Wheelchair basketball team, Kemi Akintunde, it is unfortunate that they are constantly treated as orphans. The Coach said all the attempts to get the necessary funds through the government and corporate bodies ended in futility. In Nigeria and Ghana’s absence a total of 36 games were played during the competition at the Tongaat Indoor Sports Centre in Durban. The winners of both the men’s and women’s events have earned tickets to the IWBF World Championships in Hamburg. In the men’s final there was a surprising result as Morocco defeated reigning champions Algeria, comprehensively, 63-32. The Moroccans, who Bello claims are no match for Nigeria, will fly Africa’s flag in the men’s category at the world championship. There were no surprises in the women’s final with Algeria’s experience shining through as they triumphed against South Africa, 53-25. The World Championships will feature 16 men and 12 women teams, with the games taking place at the Wilhelmsburger Inselparkarena next August. Australia have won the last two men’s tournaments, beating the United States 63-57 in the 2014 final in Incheon, South Korea. Canada beat Germany 54-50 in the women’s event, which took place in Toronto.